In a housing market with steadily rising home prices, the real estate industry has become focused on how much it takes buyers to become owners — a total cost that includes the down payment, closing costs and commissions. But there’s one question that’s often forgotten: How much does it cost sellers to get their home off the market? According to Zillow and Thumbtack, U.S. homeowners spend an average of $18,342 to sell their home. Seventy-eight percent of sellers make at least one home improvement before putting their home on the market, and they spend nearly $5,000 on professional painting, staging, carpet cleaning, lawn care and gardening and local moving costs. But the majority of selling costs stem from agent commissions and transfer or sales taxes that amount to a national average of $13,357. 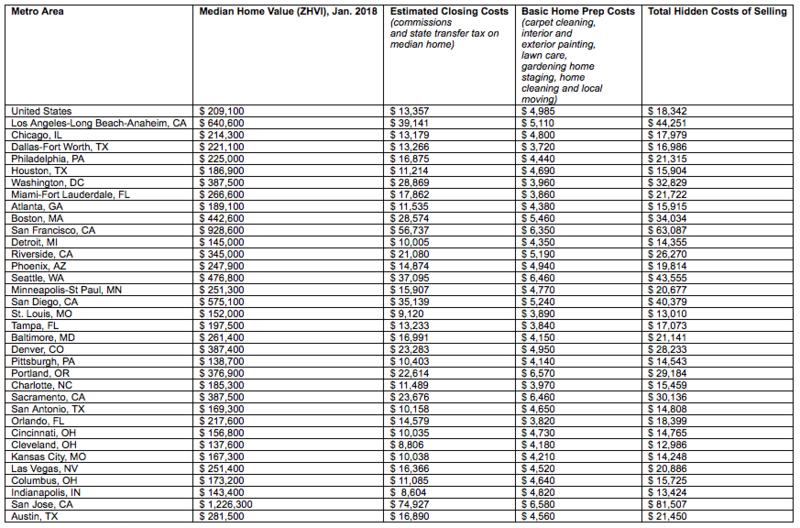 In high-priced and high-demand metros, Zillow says sellers should expect to shell out much more — homeowners in San Jose spend a whopping $74,927 in commissions and taxes on a median-priced home. Meanwhile, sellers in affordable metros should expect to come in well below the national average, like homeowners in Indianapolis who only pay a little over $8,000. “If you’re planning to sell this year, try to take some time to research what costs you may be responsible for and how they could affect your profit or even budget for your next house,” he added. Thumbtack economist Lucas Puente suggested conducting a cost analysis before investing in a number of home improvements that could yield a lower return on investment (ROI) than expected. “Homeowners starting to think about selling should take time to research and budget for the projects that can ultimately help sell their home faster and at a higher value,” he said.